At F & F Transmissions in Kilgore, Texas, we believe that auto maintenance is necessary in order to retain value, safety, and dependability. Our mission is to provide our customers with the best service and highest quality auto repair. At our automotive repair shop, we ensure value, safety, and dependability for you and your family. We believe everyone deserves the peace of mind that comes with talking to a professional for their auto repair and maintenance needs. To help you with your peace of mind, we offer a complimentary vehicle maintenance inspection and consultation about any problems you may be having with your car. Simply call or stop by our shop and we’ll be happy to help you with any your concerns. Although we specialize in transmission service and repair, we offer many other general vehicle repair services to help keep your vehicle on the road longer, including brake repair, air conditioning, and oil changes. Without a doubt auto repair can be a confusing and stressful event for many people. Our goal at F & F Transmissions is to make your service experience as enjoyable as possible. Using the latest diagnostic procedures and tools available, we perform all the necessary tests to identify your vehicle’s problem. After a the problem has been identified our courteous staff will walk you through every step needed to repair your vehicle and get you back on the road. 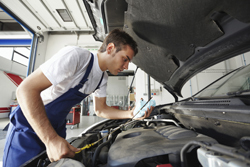 It is important to perform routine maintenance on your vehicle to keep it in top shape. Most auto parts are designed to last for lengthy periods of time but improper or adverse use can cause these parts to wear out quicker than expected. Our technicians are professionally trained and experts at stopping problems before they happen. Make an appointment today and allow us to perform a completely free diagnostic check on your vehicle to help keep you on the road longer. Every vehicle has a maintenance plan set in place by the manufacturer to insure your vehicle operates at maximum efficiency. Because these procedures are issued by the manufacturer many people assume that all maintenance must be done by the dealer only. We have been saving people time and money on routine maintenance for over ten years. From belts and hoses, to routine service checks, let our knowledgeable staff take care of you. Here at F & F Transmission and Auto Care we're not just excited about car care, but we're also passionate about your families safety. When it comes to your families well-being and you're peace of mind, brakes are a valuable safety feature. When your brakes begin to shake, pull, or whine, F & F Transmission and Auto Care is your one stop shop to keep your family safe on the road. Read more. For many people when their check engine light comes on, so does their worry. Let our trained technicians alleviate that worry by performing our free diagnostic check! Your check engine light is your vehicles way of letting you know that something’s wrong. We understand what your car is trying to say and can let you know what necessary repairs need to be performed. We are your local experts for clutches! From stock replacements to the special ordered heavy duty clutch, we have the ability to take care of you. We specialize in clutches for many vehicles, including sports cars and work trucks. We may specialize in transmissions but we are a full service general repair center. From everyday services such as brakes and water pumps to factory scheduled maintenance, we are your one stop shop when it comes to vehicle repair. Transmissions are our specialty. For 20 years our technicians have been keeping your vehicle running like new. From a fluid and filter service to complete overhauls, we are your hometown experts when it comes to this complicated piece of machinery. If you believe your having trouble with your transmission, let us give you all of the answers you need to make an informed decision. 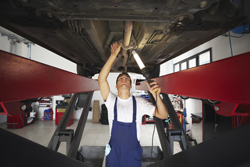 Regular transmission services help to keep your vehicle on the road longer. While you don’t have to change your transmission fluid as often as your oil, most manufacturers recommend a routine service every 50,000 miles. By servicing your transmission on a regular basis you’re minimizing damage from daily wear and tear, as well as preventing major repairs due to fluid leaks or transmission build up. Your radiator is designed to help keep your engine cool. By transferring the excess heat from the engine coolant into the air, your engine stays at an optimum operating temperature. This means you can be looking at some big problems if you’re radiator isn’t working right. We can help you keep your cool, with a variety of radiator service. Radiator flushes, repairs, and replacements, we do them all. transmissions to have problems shifting through all of their gears. "We'll check the level of your fluids..."
"We'll road test your vehicle..."
to experience the reported problem first-hand. Then our technicians will check under the hood as well as under the car to get a closer look at the possible external causes of problems. This includes placing your vehicle on a rack to check for any external problems, evaluating the condition of all of your vehicle control systems, and using our computer diagnostic scanner to check for any “check engine” codes. Contact One of Our Auto Repair Specialists Today!